Newbies don’t need state-of-the-art sewing machines and the simpler the equipment, the more convenient it is for the novice. The Janome 2212 sewing machine is the best choice for someone who is just starting the art and learning the skill of sewing. While this particular Janome model hasn’t got a lot of bells and whistles, it has features equivalent to that of an older machine. Take a look at some of these practical features which still make this Janome sewing machine suitable for all kinds of sewing requirements. With this Janome mode, threading is easy and convenient. Winding in the bobbin area becomes a cinch because you can just disengage the needle by pulling the balance wheel out gently until the thing snaps. You can easily follow the guide when you load the upper thread. Start sewing after you snap back the balance wheel in place and turn the dial for stitch selection to the designated letter for your preferred stitch. Access stitch options indicated on the machine’s top row. Adjust your required stitch length and/or width to your preference when you dial the designated letter. Access the stitches indicated on the machine’s lower level – indicated by the yellow code – and set the machine’s adjustment for stitch width on SS. This gives you the convenience of adjusting your stitch length while the machine locks the width automatically on a default setting. A dial selector for pattern. Snap-on presser feet including a multipurpose foot, a blind hem foot, zipper foot, and sliding buttonhole foot. Sewing speeds up to 860 stitches per minute (SPM). Drop-feed dog for quilting and free motion sewing. Comes with a foldable carry handle. Comes with a 25-year warranty. Dimensions are 17 inches by nine inches by 13.5 inches. With built-in cutter for thread. Width adjustment for zigzag stitching up to 5mm. Comes with three extra bobbins. Length adjustment for stitching up to 4 mm. With a seam ripper for easy sewing revisions. Comes with a set of spare needles. Incandescent lamp illuminates work area for visual convenience. Two vertical spool pins are retractable. Capable of doing 12 stitches. Comes with a small screwdriver. Bobbin winder is time saving with its quick push-and-pull motion. Clearing thread jams does not require removing the fabric being sewn. Very convenient to use when quilting or free motion sewing. Another “pro” of this Janome model is its solid construction. While it may not be computerized, the sturdy build of this sewing machine guarantees longevity for its owner. 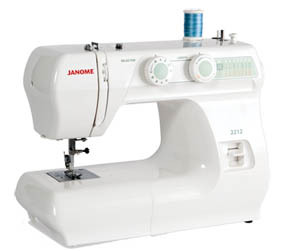 Since it is highly durable, this Janome is expected to last a couple of generations for a family that is into sewing. This Janome is perfect for those looking for a beginner sewing machine and safe to use even by young children who want to learn the fundamentals of sewing, although this basic mechanical machine may also be used by those who are veteran sewers because of its stitching quality. This sewing machine is very affordable for its class and those who are on a budget but would would find this to be a perfect fit. the 12 stitches that the machine can do limit the sewer’s options for doing more projects which require various kinds of stitches. If you want a sewing machine that has basic, albeit updated, features, and you want full mechanical control of it while sewing, this Janome sewing machine model may just be the thing you need. 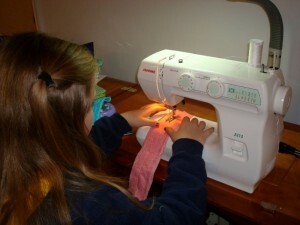 This Janome is highly recommended by customer reviews to other potential customers, especially beginning sewers and young children who wish to learn sewing. Because of its simple design, this Janome model is handy for basic clothing or décor construction such as dresses, blouses, shirts, pillow covers, table runners, curtains, and other accessories and decorative pieces that use fabric as their primary material. The wide selection of fabrics this machine can work on is impressive as well. Should you buy the Janome 2212 sewing machine? If you are a parent and have a child who wants to learn sewing but can’t seem to find a user-friendly, affordable, and quality machine, yes. If you are an individual who wants to make your own clothes and be creative doing it, yes. If you are business-minded and planning to put up a small clothing shop, then by all means get this sewing machine!